Are you feeling blue tonight?? I believe most of you has known this newest lounge in town called BLU ! This spot has been phenomenon in Social Media and actually I was so lucky invited to their soft opening, so guys I know some of you was really interested to this lounge and that's why I'm gonna share my experience here, so this is it BLU at Shangri-La. Welcome to the garden ! In collaboration with a renowned US-based marketing firm, Selavi Limited, which has been recognised globally for its partnership success stories with Marquee New York, Beverly Hilton Los Angeles, XEX Tokyo and many others, Blu is built as the newest pop-up social venue in Jakarta where sophistication, discernment, conviviality and value become the key components for guests’ enjoyment. Blu will open to the public in mid August 2014 for a limited time only, opens every Wednesday to Saturday nights from 5p.m. until midnight, patrons will be invited to chill until 9 p.m. before the fun and high energy conquers the room at 9 p.m. onwards by the beats of the guest DJs or live music performances. Surrounded by a garden and majestic pool, Blu is a definite oasis within a bustling city, providing guests with unique evocation of the French Riviera while enjoying signature libations from Moët Hennessy and selections of food specially prepared in Shangri-La quality. Such a lovely time at lovely lounge ;) The combination between white and blue brings an amazing ambiance, so relaxing. This is a new alternative for urbanites to relax after work and celebrate life offers guests a hundred seats in three types of configuration, from plush pillows on the terrace, dining sofas to customised beds in the lounge. Not to mention two bars and a communal table will be provided giving ample space to socialise in style. Blu allows all elegant women to be comfortable and still exclusively socialise by enforcing a specific dress code as style is the real luxury that is really desirable. For the most adventurous guests, a floating bar will be installed upon request providing them a unique bottle service experience in the very middle of the pool. It's getting more crowded and blue at night ! Yes, everybody looks so happy and enjoy this new lounge anyway beside drink, BLU also provide some light bites ! The have main bar where every drinks here were made and then they also have some attraction, FIRE in BLUE !! Raise Your Glass and enjoy the night ! Always love mini burger in any other occasion, easy to bite and taste wonderful ! This is BLU Signature Macaroon :9 Sweet treat for this blue night, the macaroon taste so good, I just can stop eat this chewy texture and the lovely fillings. Another sweet treat from BLU ! Lemon eclair, yes the eclair was so perfect ! and the taste of lemon was blended well with drinks served here and also the ambiance..
Long drinks starting at IDR 95.000, cocktails starting at IDR 120.000 and Moët & Chandon Champagne will be available by the glass at IDR 169.000 well if you wanna chill on the sofa or table you have to spend minimum IDR 1.200.000. Well, I recommend BLU at Shangri-La for you who like to outdoor hangout, with amazing blue atmosphere, cool music, good drink and great food, it will be your great escape from stressed ! Let's get BLUe tonight !! 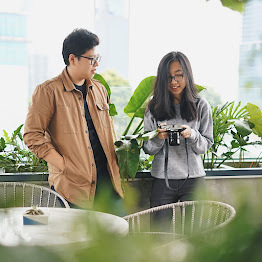 Filipus Verdi Danutirto Tanu ,I really appreciate your shared information about “BLU”It is a nice place to stay.Recently Jakarta launched a new pop-up public location called "BLU" for social people. It is most elegant and entertainment station where social people would go. Its Entrance is much familiar with Satoo Garden.I stay there after my new york and niagara tours. I enjoyed a lot there. The color combination is awesome and they maintain it in every place in the night it looks very beautiful.